EdR, one of the nation's largest developers, owners and managers of high-quality collegiate housing communities, today celebrated the commencement of construction on a residence hall at Shepherd University in Shepherdstown, W.Va. with a groundbreaking ceremony. 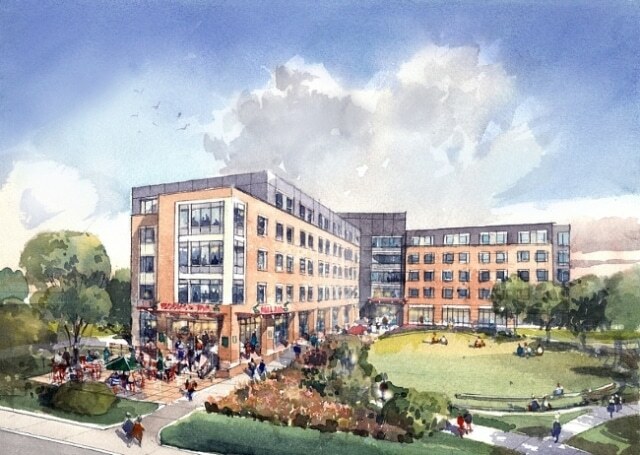 As previously announced, EdR was selected and hired by the Shepherd University Foundation Supporting Organization (SUFSO) to oversee all the aspects of this third-party development including financing, design and construction. Raymond James Financial, Inc. assisted EdR and the Shepherd University Foundation with the funding for this $22 million project. There will be a mix of single and double suite-style units for a total of 298 beds in the new five-story residence hall. Amenities will include a food service and dining area, classroom, student lounges and study rooms along with robust internet and Wi-Fi capabilities throughout the community. Upon completion in summer 2017, the SUFSO will own the building and the university will provide management services. At the groundbreaking celebration, assembled students and faculty were able to hear from university administrators about the development and get their first glimpse of renderings, which were met with great excitement. "This residence hall is a noteworthy example of Shepherd's commitment to strategically navigate with a purpose," said Shepherd University president Mary J.C. Hendrix. "This new addition will inspire student development, beautify the campus and stimulate the economy in Shepherdstown and the entire region, which are all pathways we are following to advance our premiere liberal arts university." President Hendrix invited EdR president Tom Trubiana, Chancellor Paul Hill, Shepherd Board of Governors chair Dr. Marcia Brand, Shepherd vice president for administration James Vigil, SUFSO board member Tim McShea and other executives to join her in the footprint of this planned community to turn over the first shovels of dirt on the project. "EdR is honored to be selected to work with Shepherd University on this on-campus community," said Tom Trubiana, EdR president. "High quality residential experiences not only improve the lives of students, but also help the university attract and retain top-caliber students."